Slot canyons are fascinating to explore. Carved out by the rushing water of flash floods, their winding corners and soaring walls are illuminated by the light that peers into the depths. 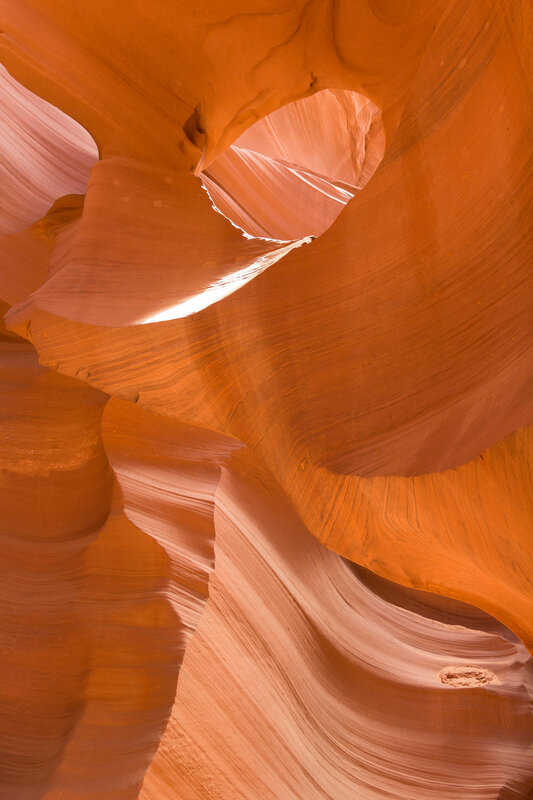 Of all the slot canyons in the world, there may be none more famous than Antelope Canyon. 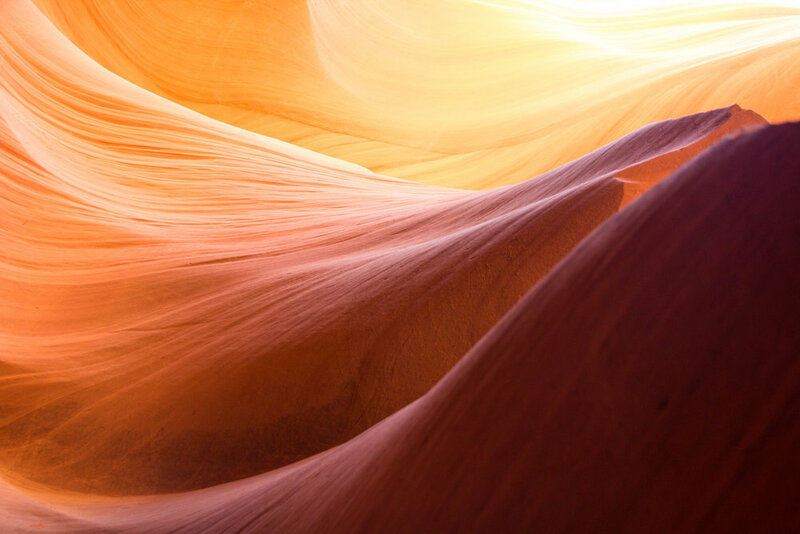 Brilliant colours of smooth Navajo sandstone are ignited in the light that is bounced between the narrow canyon walls creating a surreal setting and a photographer’s dream. This has inspired visitors from around the world to descend on the sleepy town of Page, making it one of the most sought after tourist destinations in the southwest. 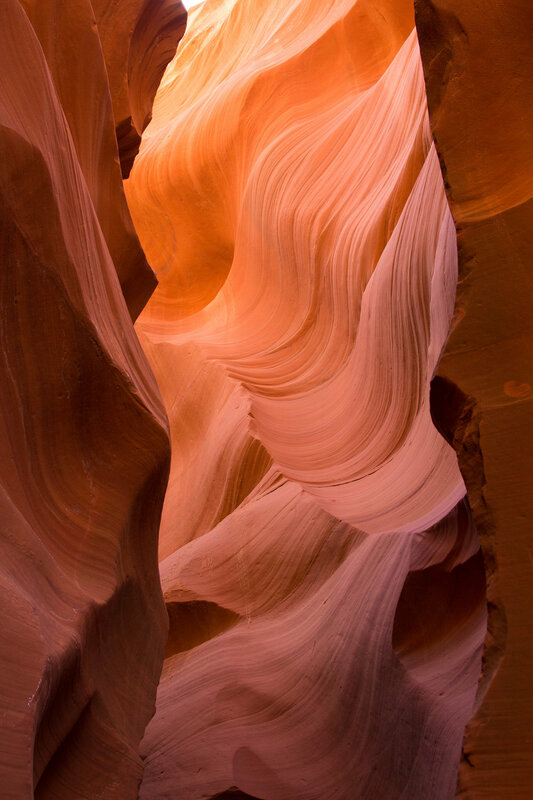 Antelope Canyon is split into two sections, upper and lower, which are divided by US 98 roughly 10 minutes east of Page. You can visit both canyons (with separate entrance fees) though many visitors see one of the pair and still have an incredible experience. The upper canyon is accessible from the ground and much wider than the lower canyon. The lower canyon is very narrow and requires climbing ladders as well as descending a steep staircase to access the entrance. Because it is more accessible, the upper canyon has a higher number of visitors. Our tour guide mentioned that the lower canyon moves 180 people through the canyon every hour (four groups of 15 people enter every 20 minutes). This translates to over 1600 visitors each day in the summer. While we have not been able to find estimates on the number of visitors to the upper canyon, some estimate it to be around 2500 per day. The upper canyon has two-way traffic because it reaches a dead end where visitors must return the same way they came. The lower canyon is one-way travel with visitors exiting the canyon by climbing out via another set of stairs. If you intend on taking photographs without others in them, this will be much easier at the lower canyon as you will simply have to wait a few seconds for the person in front of you to turn the corner. 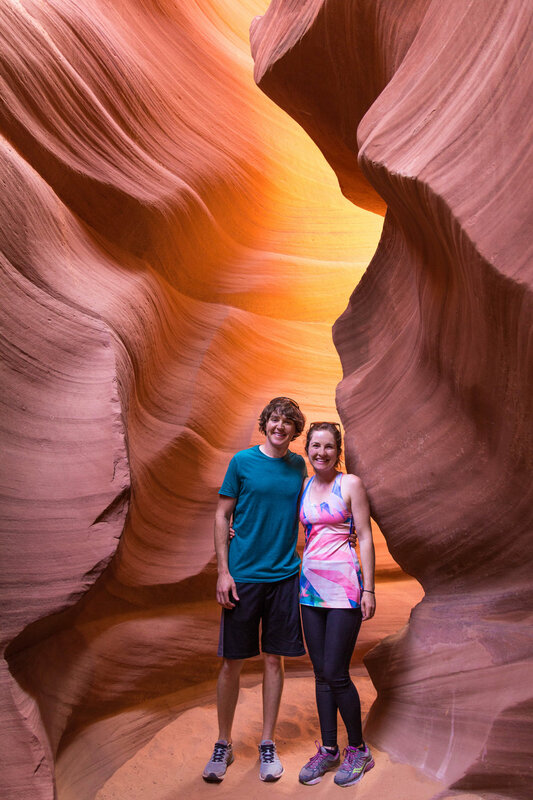 While both canyons are equally stunning, there is a greater chance of seeing the famous light beams at the upper canyon. With that said, we did witness a couple light beams at the lower canyon during our midday tour. Upper: Standard tour (1 hour): $40. Photography tour (2 hours): $120 - $160. Lower: Standard tour (1.25 hours): $25. Photography tour (2.25 hours): $47. These tours are longer because of the time it takes to walk to the canyon entrance. Note: The fees listed above are before tax and do not include the $8 per person fee for entrance into the Navajo Tribal Park. Due to the popularity of the canyons it can be difficult to book a tour on short notice. This is especially the case for the upper canyon tours. The most popular time slots for capturing the best light are midday and at the time of our visit (mid-May), there were no available midday tours for four weeks, with the only available tour times at 7:00 am or 4:00 pm (not ideal for photos). 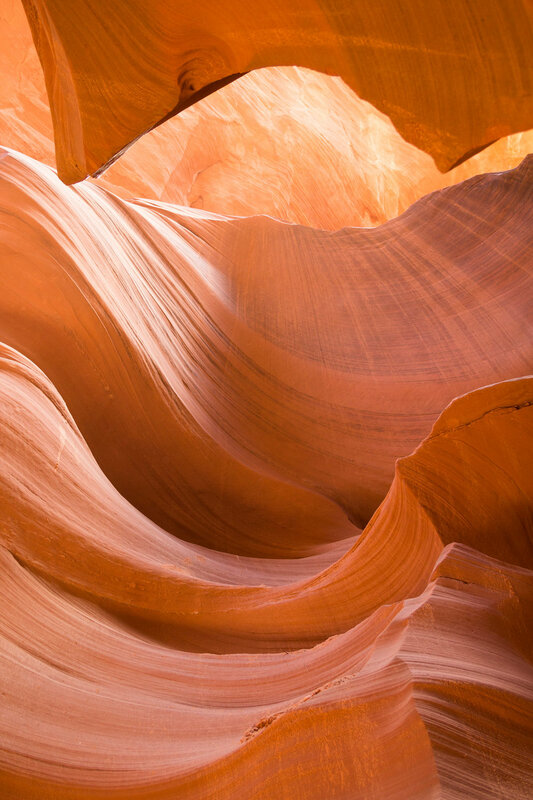 On the contrary, we were able to book a midday tour of lower antelope canyon for the following day. You are not permitted to walk into the canyon on your own, you must be part of a guided tour. If you do not book a tour in advance you will be told to wait at the entrance until the next available space on a tour (which could mean a wait of a few hours). The best time to see the canyons is between late morning and early afternoon as the sun is at its highest to illuminate the canyon walls and potentially create sunbeams down into the canyon. 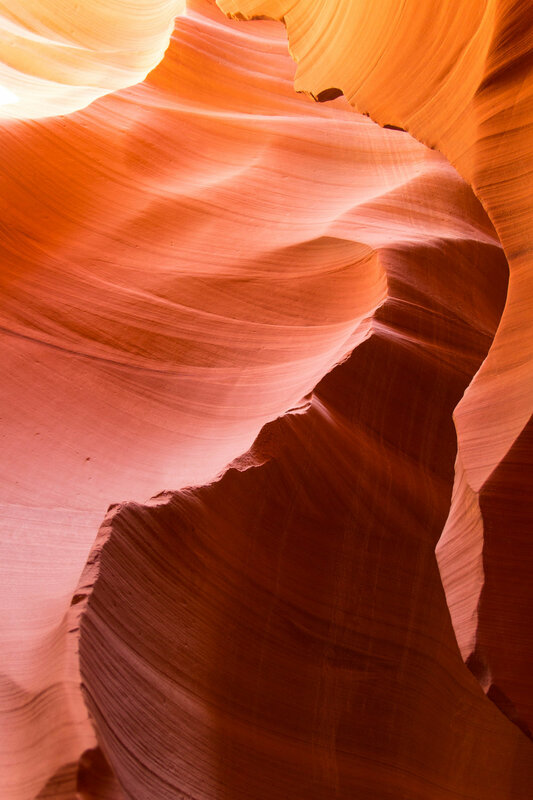 Although both tours provide an opportunity to walk through a beautiful canyon, it is important to bring expectations in alignment with reality. Unless you take a photography tour, you are not allowed to bring in a tripod or monopod and will be hurried along through the canyon with little opportunity to take it all in, yet alone photograph it. While the guides are very helpful, they have a job to keep people moving so that as many people as possible can visit. Note for those interested in photography: On the standard tour you will not have time to adjust camera settings in the changing light conditions. Tour guides suggest working in Program mode (so the camera automatically adjusts for ideal exposure) at 400 ISO, and daylight white balance allowing you to essentially point and shoot as you walk through the canyon. This was a bit disappointing, but after realizing there was only enough time to frame the shots and shoot before the group was already moving on, I figured it was better than having a bunch of incorrectly exposed shots. 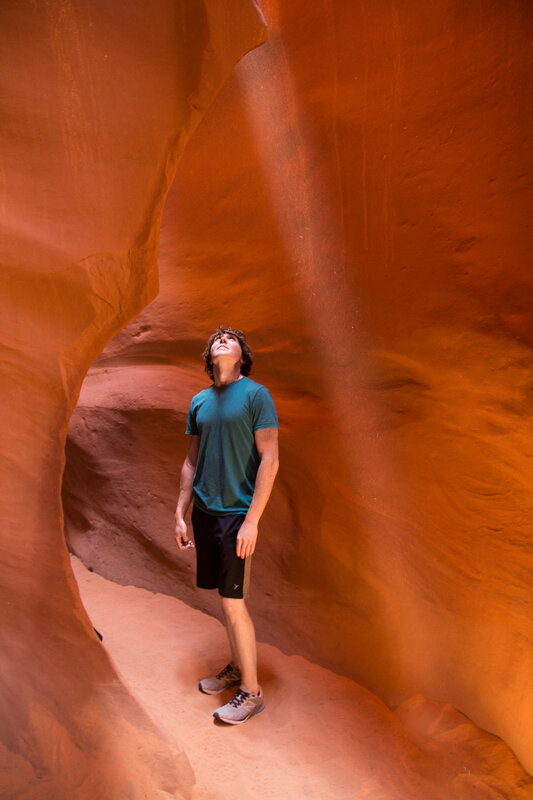 WAIT, YOU SAID I COULD HAVE A SLOT CANYON ALL TO MYSELF? Antelope Canyon is not the only slot canyon in Page, there are other canyons nearby that many have described as ‘Antelope Canyon without the crowds.’ We took the opportunity to explore nearby Waterholes Canyon and while it only had a few sections that were comparable to Antelope Canyon, we thoroughly enjoyed the opportunity to hike at our own pace in solitude (we only saw four other people during our three hour visit). As it is also on Navajo land you will need to get a permit ($13 per person) from the Navajo Parks and Recreation office at the LeChee Chapter House located three miles south of Page on Copper Mine Road. 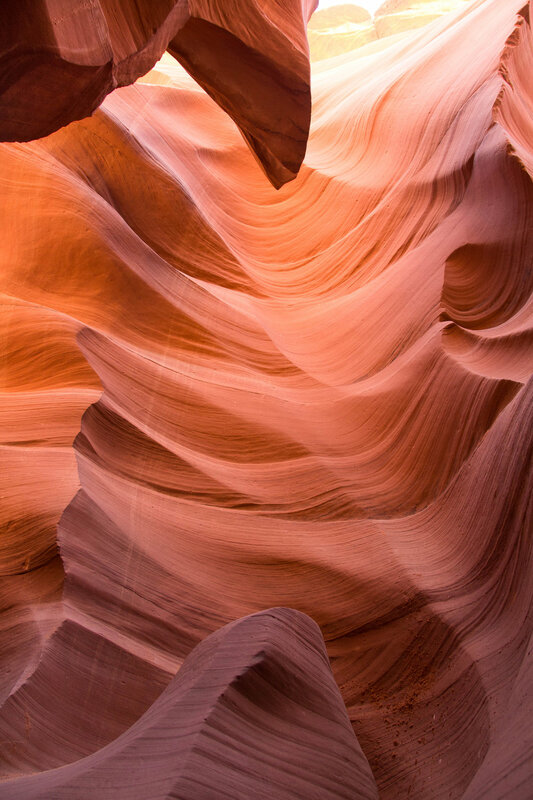 Note: this office is less than 10 minutes driving from Antelope Canyon and though we could not find a specified address, it is easily found by searching LeChee Chapter House on Google Maps. The trailhead is located 2.2 miles south of Horseshoe Bend along Highway 89 and can also be found by searching “Waterholes Canyon” on Google Maps. There is a small gravel pull-off on the east side of the highway which is marked with a green sign for Waterholes. The trail begins at the gravel lot with a combination of spray-painted arrows and rock cairns that guide you across slickrock for approximately 10 minutes then down into the canyon. From the entry point, the hike continues east through the canyon (away from the highway). 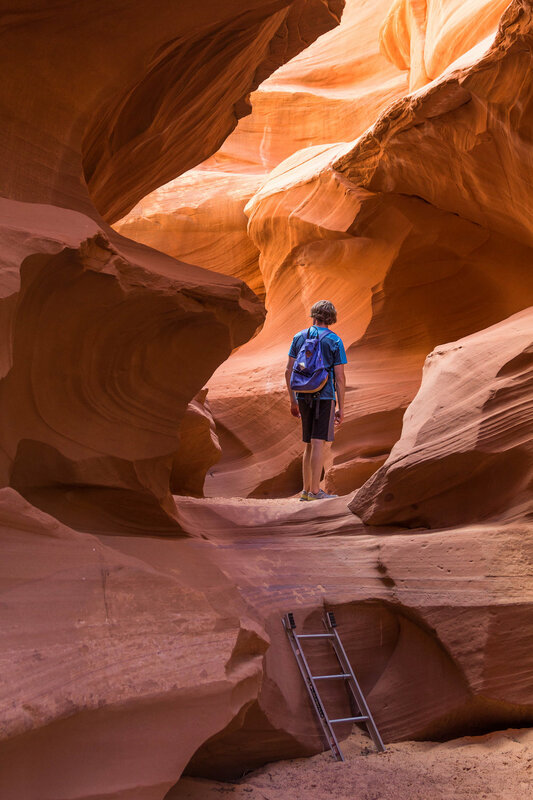 The beginning of the canyon is very wide and but after 20 minutes of hiking you will begin to experience the narrow passageways that resemble Antelope Canyon. 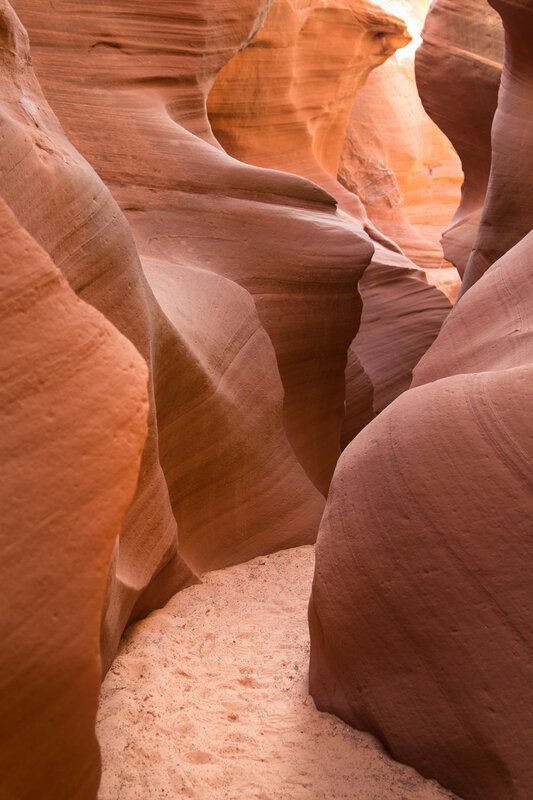 Not only will you see beautiful curving sandstone illuminated shades of red, orange and mauve, you will also be able to explore the canyon at your own pace. There are four ladders on this hike, and we can only describe them as makeshift and somewhat unstable. You will need to be extremely careful and decide for yourself if you are comfortable climbing them. If you are not comfortable climbing the ladders, there are beautiful parts of the canyon that can be seen before any climbing is necessary. With that said, our favourite parts of the hike were near the third and fourth ladder. It will be easy to discern the end of the trail, as the canyon significantly widens out into a wash shortly after climbing the fourth ladder. We read elsewhere to turn around once you reach the telephone poles however we found the best part of the hike was beyond these poles! This is an in-and-out trail so return the way you came. Watch for the exit out of the canyon as it is easy to miss and you will end up walking right underneath Highway 89. As with all desert hikes, this is an extremely hot and dry trail so we recommend taking at least one gallon (4L) of water per person. Also, there are no washrooms available at the trailhead. Word of caution: Flash floods can be deadly. 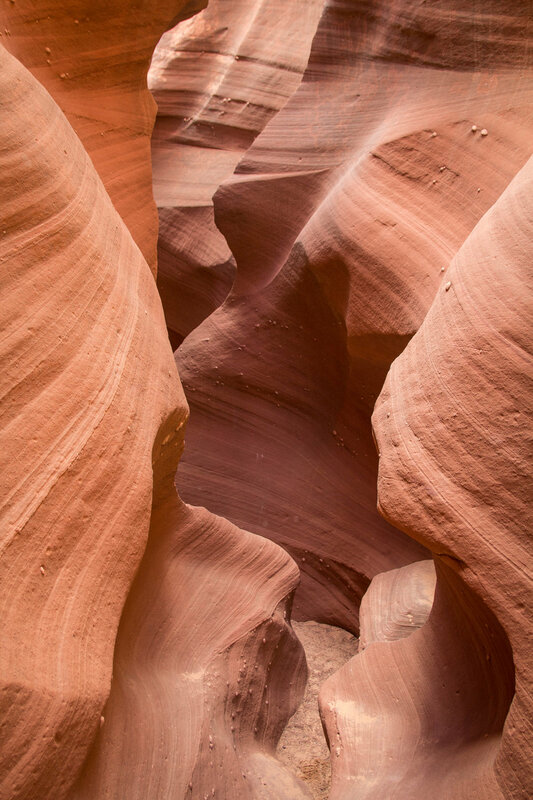 Do not enter a slot canyon in the chance of rain and always enter at your own risk. Be aware of changing weather conditions, as even rain several miles away can cause a flash flood. If you are unsure about conditions, check with staff when purchasing your hiking permit. There are very few places in the world that can be said to be a ‘must do’ for everyone regardless of their interest in the outdoors, but the Grand Canyon is one of them. Although it is the most visited national park in the US, only ten percent of visitors see the North Rim and many have not even considered the possibility of seeing this world wonder from its other side. In this post, we compare both Grand Canyon sites so that you can find which side will be best for you. As a place that must be seen to be believed, pictures of ‘The Wave’ speak a thousand words. 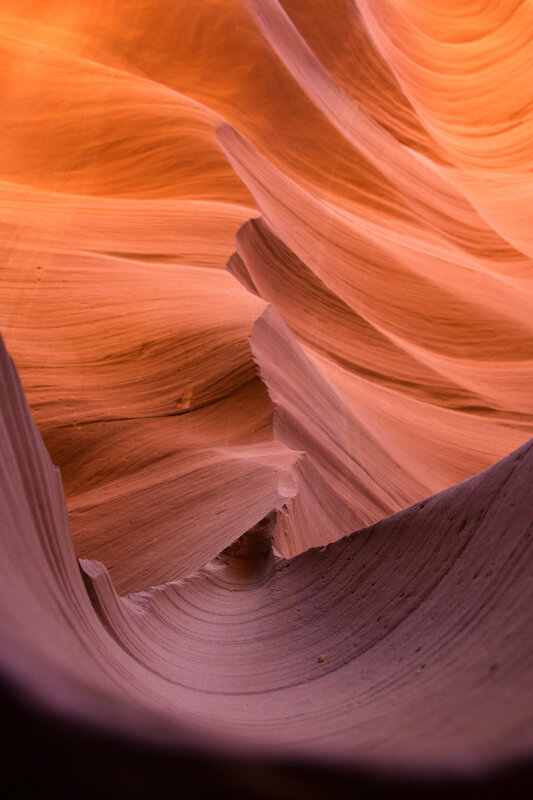 Not surprisingly, the number of people hoping to capture a glimpse of the surreal sandstone waves has soared over recent years and getting your permit will become part of the adventure. In this post, we outlined what you need to know to maximize your chance of getting a wave permit and tips for staying safe during the hike. 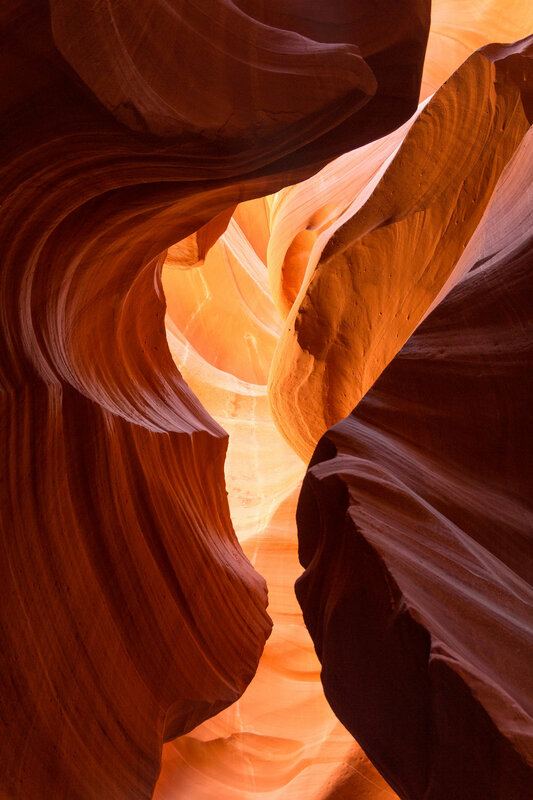 Antelope Canyon is a surreal setting and a photographer’s dream. In this post, we outline how the canyon can be visited, as well as differences between the upper and lower canyons. 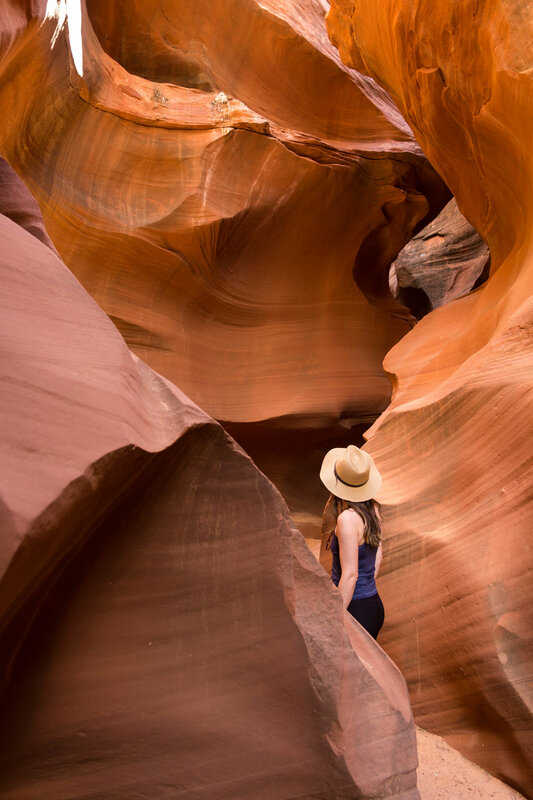 In addition, we detail our experience at Waterholes Canyon, where we had the opportunity to explore a similar slot canyon in total solitude. Petrified Forest National Park provides an up-close experience in the incredible geology behind petrified wood and the bizarre way that humans sometimes behave. Learn what gives petrified woods its beautiful colours and why you may not want to take a piece home with you. A hiker’s paradise, there are over 100 trails to experience the beauty of the Sedona region making it overwhelming to figure out where to start. We’ve put together our top five hikes we highly recommend to anyone wanting to immerse themselves in this serene setting. We outline the history of Saguaro National Park and provide tips for visiting both districts in Tucson Arizona to make sure you get the most out of your time there. White Sands National Monument is a geologic and visual wonder. During our visit, we opted for the ultimate experience and camped in the dunes, where shifting light across the landscape during sunset and sunrise created an unforgettable experience. On a journey through Santa Fe and Taos that started with the Georgia O'Keefe Museum and ended with a 1,000 year old pueblo we uncovered a world class arts scene, unique adobe architecture and a fascinating history in Northern New Mexico. Located between Vancouver and Whistler, the hike to Panorama Ridge overlooking Garibaldi Lake provides a spectacular view of the BC Coast Mountains. A true prairie oasis, Writing on Stone Provincial Park contains the largest concentration of First Nations petroglyphs on the great plains of North America. From enthralling cultural and art history to the incredible street food, Mexico City's captivating energy blew us away with how much one city could embody. Set along the stunning Maui coastline and originally built for Hawaiian royalty, The King's Highway is an ancient trail running through a Haleakalā lava flow. Alison recently visited Chile as part of a work trip to meet with winemakers, tour vineyards and learn about the fascinating history of Chilean Wine. With an outstanding effort-to-reward ratio, Rawson Lake in Kananaskis, Alberta is a must do hike to soak in a picturesque day in the Canadian Rockies. A hidden gem in the Canadian Rockies, Abraham Lake has thousands of bubbles beneath its surface that create a magnificent display to discover and photograph. Peter Lougheed Provincial park is a premier cross country skiing destination set amongst the soaring peaks of the Canadian Rockies in Kananaskis, Alberta. One of Canada's most stunning sights, Emerald Lake and its surreal reflections provided a beautiful backdrop to our snowshoeing adventure. With views of Lake Moraine and golden larch trees set against the backdrop of The Valley of the Ten Peaks, this is the best Fall hike in Banff National Park. Located in Banff National Park and the border of British Columbia, Twin Lakes is a perfect place to backcountry camp along two stunning mountain lakes. Jump in! Part two of our day hiking the Lake O'Hara Alpine Circuit. Located in Yoho National Park, it is known as one of the most stunning hikes in Canada. Part one of our day hiking the Lake O'Hara Alpine Circuit. Located in Yoho National Park, it is known as one of the most stunning hikes in Canada. The Devil's Thumb hike offers a beautiful, unparalleled view of Lake Louise and Lake Agnes, making this a must do hike to take in the world famous scenery.